The Sharks will lean heavily on the scrum to save them from a five-year slump against the Bulls when the teams clash at Kings Park on Saturday. This match marks the ninth time these teams have met since the 2014 opener, and the Sharks’ best result during that period was a 16-16 stalemate at Loftus Versfeld. Three weeks ago, the Bulls clinched their fourth straight win against the Durbanites – the longest streak in this rivalry’s 31-match history. Though the Sharks have won seven of their last eight matches at Kings Park, they suffered their biggest loss against the Bulls when the teams clashed in Durban last April. But the hosts will trot on with the confidence of a good win against the Rebels while the Bulls are smarting from a hiding at the hands of the Chiefs. Both SA conference contenders employ a high-volume kicking game and a direct, confrontational attack with limited passing, but the Sharks attack is like an American muscle car – loads of horsepower, but it handles like a wild stallion. Boasting the comp’s second-most efficient attacking breakdown, the Sharks produce quality ball and continuity through the sheer force of unsmiling, heavy-hitters such as Dan du Preez. But for all that output, the Sharks have only scored 16 tries, less than seven other teams, and are ranked ninth for points scored. This is in stark contrast to the Bulls who are averaging the third-most points scored per match despite an attacking breakdown that is, bar one, the least impressive in Super Rugby. The difference is that the Sharks invest kickable penalties in a ticket to the Maul-Try Lottery while the Bulls flick the kicking tee to Handre Pollard. 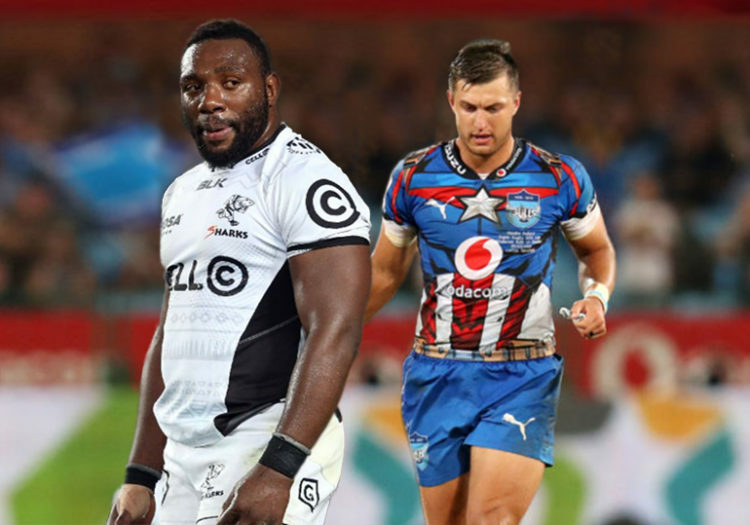 Captain Pretoria is Super Rugby’s leading points-scorer and while the Bulls have scored 63 points from 23 shots at goal, the Sharks have only pointed to the sticks seven times this season. That’s an easy escape clause for the Sharks’ opponents who have happily smothered threatening forays in the knowledge that Robert du Preez will usually square his hips up for a punt to the touchline. Conversely, the Bulls are able to build scoreboard pressure, converting into points the territorial gains made by Super Rugby’s biggest kicking game. The Bulls air force is supported by the thick armour of a defence that boasts the best tackle efficiency (87%) and an attack loaded with the most efficient lineout (95%). Meanwhile, the Sharks have missed the sixth-most tackles despite completing the fifth-fewest takedowns, and are boosting jumpers in the third-worst lineout. And where the Bulls are averaging among the top five in turnovers won, no team has poached less ball than the Sharks this season. That ranking is unlikely to improve this week as the Bulls have conceded the fewest turnovers per match. But what will have had the Sharks excitedly scribbling all over the whiteboard this week is the opportunity to attack a creaking Bulls scrum operating at 88% efficiency. The Sharks scrum is ranked seventh (93% efficiency) and they’ll be aiming to use that advantage to negate the Bulls’ strengths. If the home team gets the shove on, they’ll have a shot at breaking down their rival’s defence (by running downhill at a pack that’s backpedalling) and kicking game (by reversing territory through scrum penalties), to bank a rare win against the three-time champions. Thanks Zelim, a good analysis – it certainly will be a tough encounter! The last outing in Durban last year came after an extended overseas trip. Most teams had a bi weekend after traveling, but not the Sharks. They were running on empty. The Sharks personnel 1 – 8 are pretty solid, but I don’t think they are coached very well – poor technique – so concerned that there will not be as much in it at scrum time as there might be. On the breakdown issue. Phillip Van def Walt is back – stats wise he was arguably SA’s best loosie in 2018. It will make a difference. Line outs are likely to be an issue for Sharks, because they have Botha, Paul and Jean-luc out! Agreed on the issue of kicking for posts. Rob Du Preez topped points stats in 2018, so for heaven sake why not use that resource? The last positive for Sharks will be the New Zealand ref. Sadly Sharks get better treatment from foreigners than they do from or local Glens! Home ground advantage, Sharks by a tad! Seems you may have been right about Fraser but sadly forgot about the TMO. Pretty shocking if you ask me. Don’t hold your breath if you think Fraser is going to be doing the Sharks any favours! If they go in with the attitude that they need to smash the other side to win they will get penalised. It would help if RDP (sen) stopped making statements in the media along the lines of how they got bullied. If the discipline was better they would probably not have lost a game as yet in this competition. John, not looking for favors, just an even hand, as most supporters would want! He did just fine in Durban a few weeks back, as has Rasta! Assume you’ll be checking out the Cape Town stadium sound system tonight? Are you talking about the Ed Sheeran concert? It was last night. Keep up Barry! My daughter went and by the time she got home I was staring at the back of my eye balls. I’ll find out about the sound system this evening. Great article Zelim always love your analogies. If I were a betting man I’d have a punt on the Sharks winning this one. I don’t think The Bulls are everything they are cracked up to be. They were badly exposed by the Chiefs. They beat a badly disorientated Stormers team and the Lions are a better team now than when they played the Bulls. My bet is if they had another crack at the Bulls they will beat them. If The Sharks can get the discipline right and at least parity in the lineouts then it’s game over. The sharks have the best defense in the tournament by far at this stage (8 tries conceded)statistics and what they don’t reveal and all that Zelim. True and we all know defensive wins competitions. Don’t get me wrong Boyo I ain’t no Shark fan but I think they will go far this year. To win down under you have to have a rock solid defense. The Stormers proved that a few years ago under Rassie and AC and had they stuck with that they would still be winning overseas. The moment The Stormers bought into the concept that we must play the same game as the NZ sides was the day they went backwards at a rapid rate. I hope so John but both us Sharks and Stormers fans have had too many false dawns to get excited. I agree on the NZ point we went off course as a country when we tried to play like NZ we are south africans and the way we play is best for us. Unfortunately, if you’re going for a championship win, you have to play for bonus points every game. Hence the expansive style paired with stingy defense. Teams just don’t goal kick themselves into home semi’s or finals with out tournament tries. Finals in NZ are dead rubber. That is true Chris, but you can put your opposition under score board pressure by taking the kicks initially. The pressure creates the opportunity for seven pointers! The poor ball poaching stat of the Sharks is no surprise. Big, heavy loosies are slow to get to the ball – a law of mother nature. Both teams tend to prefer old testament rugby. That makes it difficult to call this game due to their similarities. With this style employed at both ends, the Bulls may have a slight edge with Pollard? They had three injuries amongst their loose forwards – Du Preez, Paul & Van dear Walt, so doing pretty well really with third and fourth choice!